Ferries Greece Italy Greek islands online. Greece Greek Ferries Routes Greece Italy Albania Turkey. Sea Travel ferries to Greekislands. All Greek Ferries schedules, fares, availability and online booking to GREECE - Corfu - Igoumenitsa - Paxi - Kefallonia - Zante & Patras, from ITALY - Ancona - Bari - Brindisi Ravenna & Venice. 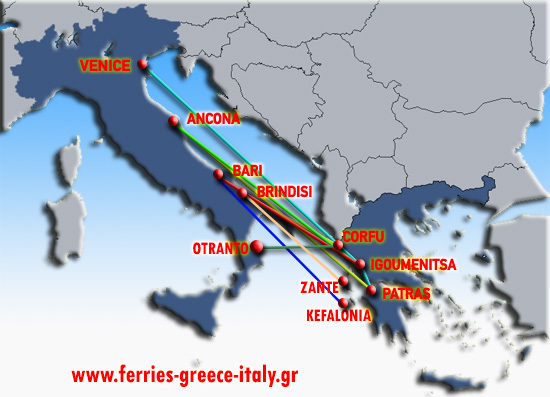 Ferries from Italy to Albania and from Greece to Turkey.